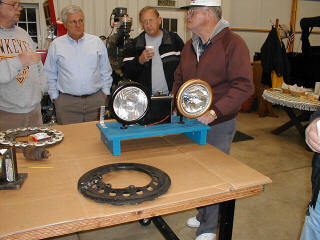 The October meeting was held at Jack Putnam's garage near Bluffton. Bob Torbet led the meeting with 11 members in attendance. 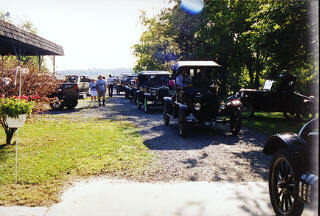 Reports were given on the success of the 14th Annual All Ohio Model T Jamboree. Everyone seemed to have a good time. Bob showed a video tape of one of the Lima Newscasts that was made at Tilton Farm while we were there. The motel and all of the contributors have been officially thanked for their help in the effort. Ray Sutton mentioned and everyone agreed that it would be a good idea for our club members to have name tags to wear for the meetings. We do tend to wander around the room and talk with one another without knowing who it is that we're talking to. Sue Cook will have name tags for the next meeting. 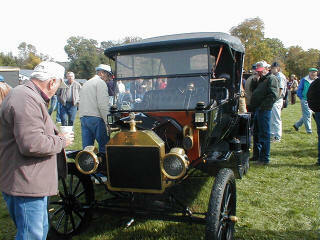 Jack Putnam and Jim Cook talked about their experience with the Old Car Festival at Greenfield Village. Jack took second place in the commercial class with his 1926 truck. Jim couldn't say enough about the differences between this show and any other "car show". There's not all of the sitting around as people walk by and complain about the authenticity of your car. 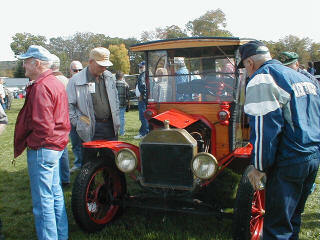 This 1914 show car went for $13,000. It was an older restoration and a lot of the paint job was cracking. Still a good deal! 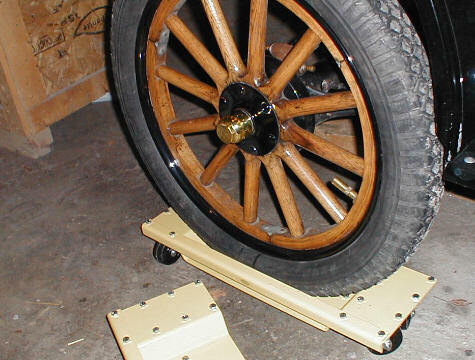 1915 Depot Hack that went for $10,000. I'm not sure if the guy that bought it knew enough about a T to drive it home. 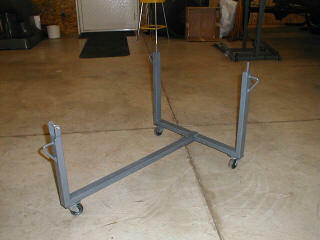 Estate sales are always kind of sad occasions. 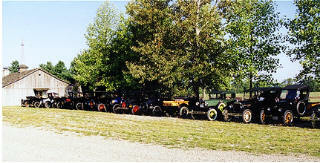 This Picture was taken on a happier occasion on an Amish country tour a couple of years ago. 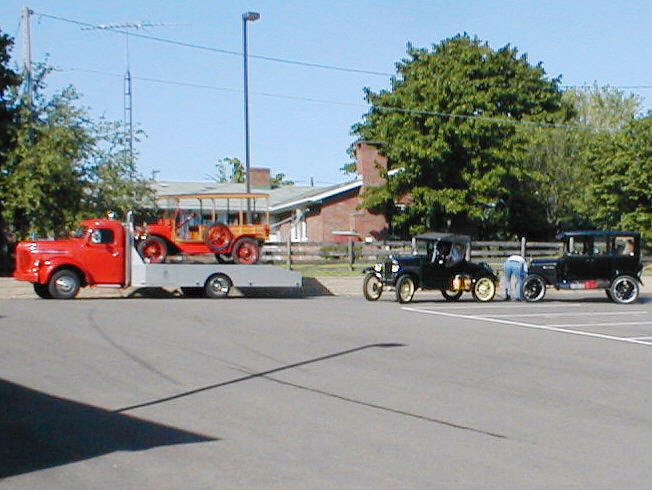 It shows the 1947 REO car hauler that Carl used to drag his Depot Hack around the country. It went for $8,500. 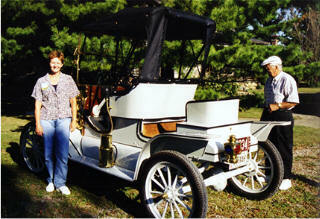 The Roadster is owned by Chuck and Linda Reese. It climbed Pikes Peak this last summer. The enclosed car belongs to Jerry Banks. The theme of "Covered Bridge Tour" was a bit misleading. 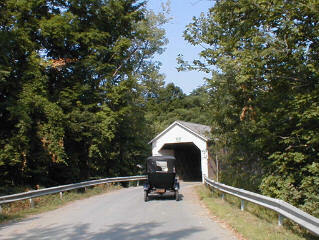 Really we just went over this same covered bridge every day of the tour. But it was a well planned out tour. Don Buesing did a great job of organizing this year's tour. 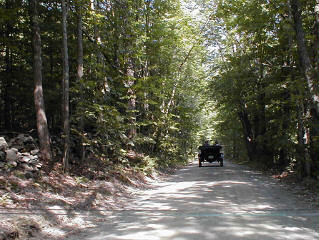 The best part of the Keystone Cops Tours is the back road driving. We always get some magnificant shots through the afternoon shadows. Next year's tour will be back in Pennsylvania. Brad Wallace promises more of the same scenery. Here we see the destination of a jaunt into Vermont. This is the rail yard in Rutland where the Vermont Railway, Clarindon and Pittsford, and the Green Mountain Railroad all converge. 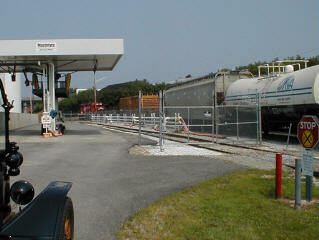 That's "Old Henry" in the photo sitting near the McIntyre Fuel depot. Jim models the Green Mountain. 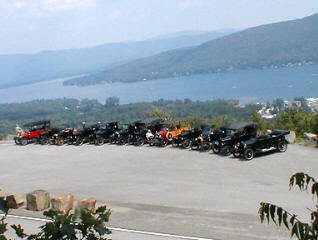 This is a view from the mountain overlooking beautiful Lake George, NY. The cars were gathered for this group shot before heading back down the mountain. The last four cars on the left are the ones that made it to the top of the mountain. That's an EMF on the end. 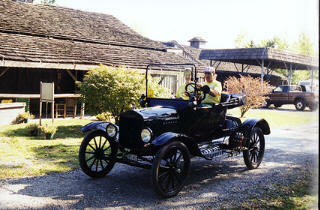 Here we see Vern Campbell at Tilton Farm during the Sunday brunch stop. Vern was our speaker for the banquet later that evening. He spoke on his experiences on the Australian Tours. 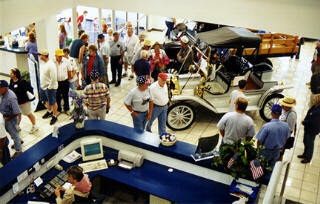 This photo was taken inside of Findlay Ford during the Saturday brunch stop. Stan rolled out the red carpet and had his staff highly involved in the effort. 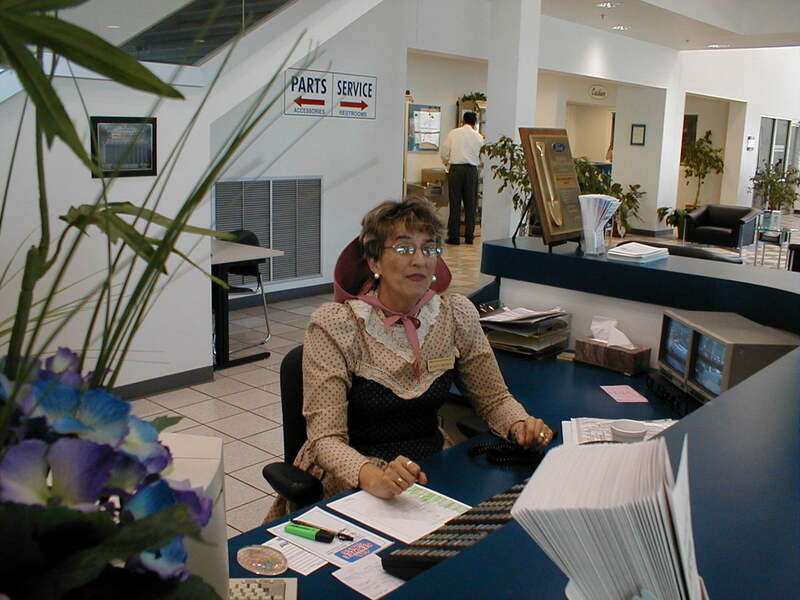 The receptionist was even in period dress for the day.